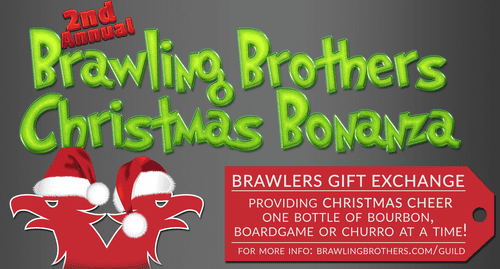 What is the 2nd Annual Brawling Brothers Christmas Bonanza? Welcome to the gift exchange. We at the Brawling Brothers strongly believe that our close knit community has grown significantly in the last year and we feel it is worth continuing tradition... yes we can now call it tradition by bringing back our Christmas exchange. We would be here without you the guild members and listeners. We want to provide a place for the members to find some extra Christmas cheer this year and really emphasize our belief that it is always best to lead by giving. All you need to do is click the link at the top of this post and then click Join. Replying to this thread does not sign you up for The Brawling Brothers Christmas Bonanza. You must join through the link provided above. By joining the exchange, you are agreeing to buy a gift for another user and have it shipped in time for Christmas. Your total cost for the game(s) and shipping should be a minimum of $50 USD. A Strong word of Advice... Make this Special and Wrap the Present(s). After Registration closes (sometime after 11:59pm (GMT -6) on November 30th) we secretly assign everyone a gift-giving target. This means that you will be the Brawlers Bonanza Gift Bringer for another Brawling Brothers Listener, and you will also get a gift in return! 1.) First and foremost, This is all about the giving. Getting is fun too, but be prepared for the possibility that the person who is sending you a gift may disappoint you. I believe we Brawlers do a good job, but there are always going to be a handful of unfortunate situations that come up. We will help to prevent this. If you sign up for the Bonanza, treat it as a responsibility and make it a priority. Those who sign-up but don't send gifts will face the possibility of account privileges being suspended as a result. 2.) You have until 11:59pm (CST, GMT-6), November 30th to sign up. If you have second thoughts after signing up, you also have until that deadline to delete your registration. 3.) Keep your wishlist (NOT WANT LIST) of games updated. The expectation is that your Santa will send a new game from your wishlist. Please try to have at least twenty currently available games on your list, and try to have most of them fall within a reasonable price range. If you have a small, expensive, or difficult-to-fulfill wishlist then don't be surprised if you get something that isn't on your list. The more you have on your list the easier it is for your Brawler Cheer Giver to find something for you. 4.) When it comes to sending, the expectation is that you will buy a new game from your target's wishlist. The total cost of the games you send (including shipping) should be at least $50 USD. I would encourage you to spend up to $50 USD on the game and then add shipping. There is no problem, of course, with going above and beyond - sending two, three, or even more games. The generous Brawlers are the best remembered! And you will make it truly special if you personalize the gift somehow. ALL participants must provide proof of purchase and/or shipment. A special email address will be provided when targets are assigned. This step speeds up the process of resolving complaints considerably. 5.) This is an international Christmas Bonanza. Anyone from any country is welcome to join. Understand that you very well may be given a target from a foreign country, so be prepared to factor international shipping into your gift. 6.) This is intended to be an enriching experience - not a stressful one. So the most important rules is HAVE FUN! Thanks so much for setting this up, Ryan. Can't wait to find out who my VICTIM is this year. Fresh G is the man! Can’t wait to see who I fill with holiday cheer. I can't wait to see who I feel with holiday cheer too. Will Igor be participating this year? Last year someone got a box with a note to send help he was locked in a dungeon only to be let out for house showings and to run grocery errands for some Dr Cool guy....whole thing was weird. We had 36 participants last year! Lets get 50 this year. Sign up and then help us spread the word! Can't wait to get this kicked off. Havent seen you post in ages. Welcome back to the Christmas adventure. It's been a busy year what can I say lol !!! We need more people! How do we get more people!!?? They BROS posted it on Facebook... go to there page and share the link! This isnt one more... this is the one you did last year. I heard a Rumor the Christmas exchange with the most cheer was back on!!! I look forward to getting my elves busy for the brawling brothers and their brawlers. There you go, 1 more signup. well.. seems I can not stop adding to my wishlist after seeing what people have received so far in the BGG secret santa.